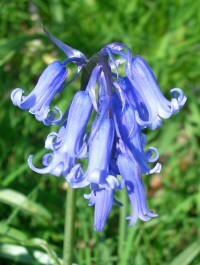 The bluebell is commonly found in deciduous woodland, especially in oak and beech woods. For a few weeks each year they form spectacular carpets of blue amongst the trees. English bluebells are under threat from the Spanish bluebell (Hyacinthoides hispanica). A hybrid (a cross between the English and Spanish bluebell), has been cross-breeding with the native species and threatening its existence. It is now illegal to collect native bluebells from the wild for sale.